My dog has urate bladder stones. What are they? Dogs, like people, can develop a variety of bladder and kidney stones. Bladder stones (uroliths or cystic calculi), are rock-like formations of minerals that form in the urinary bladder, and are more common than kidney stones in dogs There may be a large, single stone or a collection of stones that range in size from sand-like grains to gravel. .
One of the most common uroliths in Dalmatians is composed of urate crystals. Urate bladder stones are most commonly the result of a genetic abnormality that causes a defect in the metabolism of uric acid. Other causes of urate bladder stones include liver diseases such as portosystemic shunts. In these situations, urate bladder stones may form if the urine is highly acidic or becomes extremely concentrated. If urate bladder stones or crystals are diagnosed in a dog that is not a Dalmatian, the dog should be tested for the presence of a liver shunt. How common are urate bladder stones? While bladder stones are somewhat common in dogs, urate stones constitute only about 5% of all bladder stones diagnosed, according to recent studies. Breeds most commonly diagnosed with urate bladder stones include Dalmatians, English bulldogs, and Black Russian terriers. In these breeds, genetic testing should be performed prior to breeding to reduce the occurrence of this condition. 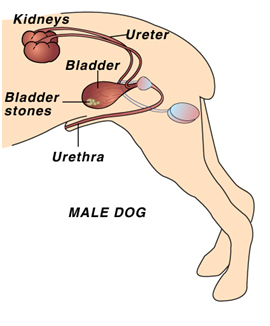 Urate bladder stones are more common in male Dalmatians (97%) than females (3%). What are the symptoms of urate bladder stones? The general symptoms of bladder stones are very similar to the symptoms of an uncomplicated bladder infection or cystitis. The most common signs that a dog has bladder stones are hematuria (blood in the urine) and dysuria (straining to urinate). Hematuria occurs because the stones rub against the bladder wall, irritating and damaging the tissue and causing bleeding. Dysuria may result from inflammation and swelling of the bladder walls or the urethra, from muscle spasms, or due to a physical obstruction to urine flow caused by the presence of the stones. Veterinarians assume that the condition is painful, because people with bladder stones experience pain, and because many clients remark about how much better and more active their dog becomes following surgical removal of bladder stones. Large stones may act almost like a valve or stopcock, causing an intermittent or partial obstruction at the neck of the bladder, the point where the bladder attaches to the urethra. Small stones may flow with the urine into the urethra where they can become lodged and cause an obstruction. If an obstruction occurs, the bladder cannot be emptied fully; if the obstruction is complete, the dog will be unable to urinate at all. If the obstruction is not relieved, the bladder may rupture. A complete obstruction is potentially life threatening and requires immediate emergency treatment. If urate bladder stones form as a result of a portosystemic shunt, the dog may also show signs of neurologic impairment (dullness or disorientation, head pressing, or seizures). How are urate bladder stones diagnosed? In some cases, your veterinarian may be able to palpate (feel) urate stones in the bladder, if the dog is relaxed and the bladder isn't too painful. However, some stones are too small to be felt this way. Unfortunately, urate bladder stones are often radiolucent, meaning that they are not visible on plain radiographs. This means that your veterinarian will need to perform other imaging studies, such as a bladder ultrasound or a contrast radiographic study, a specialized technique that uses dye to outline the stones in the bladder, in order to detect these stones. If your veterinarian is concerned that your dog may have urate bladder stones, based on breed, results of a urinalysis, and/or results of blood tests that indicate a liver problem, one or both of these specialized imaging studies may be recommended. The only way to be positive that a bladder stone is a urate stone is to have the stone analyzed at a veterinary diagnostic laboratory. In some cases, your veterinarian may make an educated guess about the type of stone that is present, based on the findings on imaging studies and results of a urinalysis and/or blood tests. For example, if ultrasound or contrast x-rays show that there are one or more stones present in the bladder, and the results of the urinalysis show the presence of acidic urine and numerous urate crystals, your veterinarian may make a presumptive diagnosis of urate bladder stones and start treatment accordingly. Q: How are urate bladder stones treated? A: There are two primary treatment strategies for treating urate bladder stones in dogs: 1) non-surgical removal by urohydropropulsion, and 2) surgical removal. In some cases, small stones may be removed non-surgically by urohydropropulsion. In simplest terms, the bladder stones are flushed out of the bladder using special urinary catheter technique. This is only possible when the stones are very small in diameter. If your veterinarian has a cystoscope, small stones in the bladder or urethra can sometimes be removed with this instrument, thus avoiding the need to cut the abdomen and bladder open. Either of these procedures may be used to obtain a sample stone for analysis so that your veterinarian can determine the most appropriate treatment options. Surgical removal is commonly recommended in cases where the bladder stones are too large for urohydropropulsion, when there are a large number of stones present in the bladder, or if there is an increased risk of urinary obstruction. This is also the quickest way of treating bladder stones; however, it may not be the best option for patients that have other health concerns, or in whom general anesthesia could be risky. With this option, the stones are removed via a cystotomy, which means that the bladder is surgically exposed and opened so that the stones can be removed. This routine surgery is performed by many veterinarians and dogs usually make a rapid post-operative recovery. If the stones have obstructed the urethra, so that the dog is unable to urinate, an emergency surgery must be performed IMMEDIATELY to save the dog's life. Your veterinarian will discuss the pros and cons of each of these options with you and help you decide which option is best in your situation. In some selected referral centers, a third option may be available to treat urate bladder stones. This option is ultrasonic dissolution, a technique in which high frequency ultrasound waves are used to disrupt or break the stones into tiny particles that can then be flushed out of the bladder. Due to its lack of availability, this option is not widely used. It has the advantage of immediate removal of the offending stones without the need for surgery or general anesthesia. Your veterinarian will discuss this treatment option with you if it is available in your area. How can I prevent my dog from developing urate bladder stones in the future? Dogs that have experienced urate bladder stones will often be fed a therapeutic diet for life. Dogs with liver disease will need to be treated appropriately prior to addressing urate bladder stone management. Diets lower in protein and therefore lower in purines, one of the building blocks of urate crystals, and promote slightly alkaline urine are recommended. Canned or wet diets are often preferred to help encourage water consumption. Dilute urine (urine specific gravity less than 1.020) helps decrease urate stone formation. In certain cases, medications such as allopurinol may be required. In addition, careful routine monitoring of the urine to detect any signs of bacterial infection is also recommended. Bladder x-rays and urinalysis will be performed one month after treatment and then every three to six months for life. Many dogs will need to have bladder ultrasound to detect early urate stones that are small and may not be visible on x-rays. Dogs displaying any clinical signs of urinary tract infections such as frequent urination, urinating in unusual places, painful urination or the presence of blood in the urine should be evaluated immediately.